Fuze blowing - . : XT660.com - The #1 XT660 Resource :. Ok so I was on my way home from work yesterday taking the scenic route as it was nice. Suddenly the bike died, and would not start again, it would turn over but wasn't starting. Tried a few things no luck so called out the RAC guy, he came and started checking fuses, found one that was dead, replaced it with a spare I didn't even know i had and it started straight away. He did mention it could be a ongoing problem and i might need to see to it, and he was right as it did the same on the way to work this morning, so swapped for my other spare. I'm not sure i have another spare, so where would i buy one (some)? And has anybody any idea what it could be? I'll try and trace where the fuse goes later on. If the fuse keeps blowing then the RAC man is right: you have an underlying problem and it will need looking in to. For a starter, it would help to know which fuse is blowing. Which number is it in the fuse box? What colour/rating is it? Fuses can be found in most garages and car parts shops like Halfords. I believe it was the number '10' and I think it was red/orange? I'll have a look at lunch as i have the tenere manual.pdf as a guide too. Last edited by Deke; 21-04-16 at 11:57. I've had a look at the fuse box and compared it to what it shows in the manual, and it looks like it could be the Radiator fan motor fuse that is playing up. Possibly, but not all that likely. The fan load is the only thing supplied by this fuse (which is number 6 - brown 7.5A) and shouldn't really affect anything else. However, if the fan relay is goosed (and causing the fuse to blow) there is a slight chance that other circuits could be affected as the relay's positive trigger feed is linked to the start inhibit system, dash, coil etc. and the negative is switched by the engine temperature sensor via the ECU. The internal diode (connected in parallel across the trigger +/- takes up the energy stored in the relay's coil when current is removed. Without the diode, that energy has no place to go and will cause a potentially damaging voltage spike. Firstly, are you absolutely sure it is fuse #6? If it is, then what I would do is pull the fan relay from its socket and see if the bike runs without blowing the fuse. Obviously you don't want to be riding in traffic without the fan in operation and keep an eye on the temperature warning light. (If you can get hold of a diagnostic tool you could run the fan relay test.) If it still blows without the relay in place then there'll be a wiring fault and a short to ground somewhere. You'll have to trace the wiring and see if you can find anything amiss. If the fuse doesn't blow, then refit the relay and try disconnecting the fan and see what happens which should tell you whether the fan or relay is at fault. As I said though, I can't see why the fan itself would cause a non-running situation. I got home ok last night and back into work today with no trouble. I did notice yesterday that the fan on the radiator wasn't spinning, and it was after a 5 mile journey in warm weather, is that normal? I've circled it, the 7.5 was the only spare i had so i used that to replace the 10. The fan will only ever come on (in UK weather anyway) when stop-start riding in heavy traffic (or riding off-road slowly) in higher ambient temperatures. During April in Lancashire I'd be amazed if was ever needed, unless you were any a traffic jam for a long time! So what you describe is perfectly normal. The most common and likely reason for this fuse to blow is a short (probably intermittent) caused by abrasion of the wiring to the injector on the top right hand frame rail under the tank. 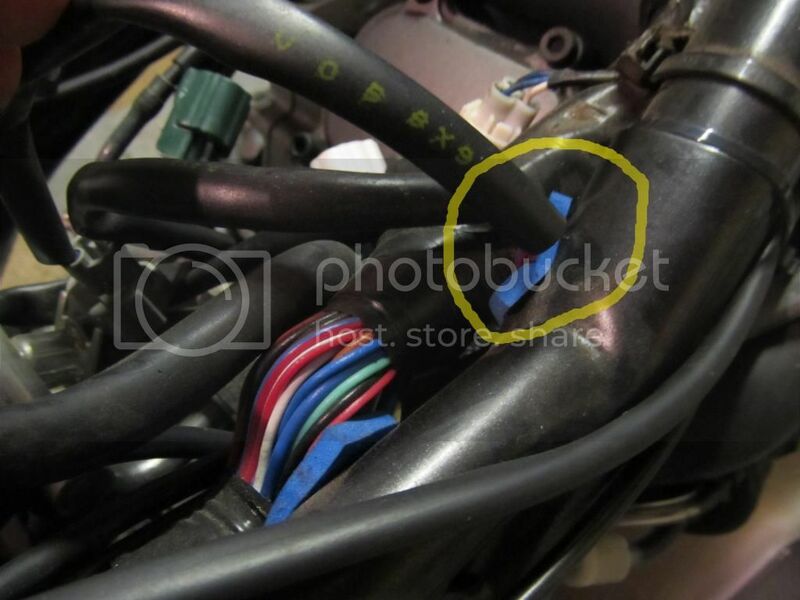 Remove the tank and have a look at where the fuel injector wires spur off the main loom. It will be obvious if this is the issue. You will need to repair the wires, fit a foam pad to stop it wearing through again (photo) and refit the correct 10A fuse. Have a look into this first and then post back. Ok Thanks for that mate. I had just filled the tank up not long before too so the extra weight must have triggered it. I'll do as you say and get back to you. Many thanks for this information. I had exactly the same problem and sorted it in 10 minutes with your help.